Edwin Mulenga works as a Principal Examiner in the Pension and Insurance Supervision Department at the Reserve Bank of Malawi. He holds a first class MSc in Actuarial Science from Heriot-Watt University and a BSc in Mathematics and Computer Science from the University of Malawi. Prior to switching to the actuarial profession in 2014, he worked as an IT security officer in the central bank and as network administrator at the US Embassy – Centers for Disease Control and Prevention in Malawi. He is two exams away from completing Fellowship exams with the Institute and Faculty of Actuaries (UK). 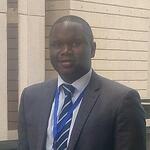 He is a founding member of the actuarial association in Malawi. ACTEX Learning (AL): How many practicing actuaries do you have? EM: As a program in a university, we have had students in a private university studying Actuarial Science since 2014. Our public university took in its first actuarial science cohort in 2017. However, multinational life insurers have engaged actuaries for a long time from abroad to undertake liability valuation and provide other advice. EM: Well, I am not an actuary yet (I will be in few months’ time since I already completed associateship exams last December), but I currently enjoy responding to the popular question—“What or who is an actuary?” Secondly, as a student I have come to appreciate the vast amount of knowledge one learns through the exam process and how easy it is to apply such knowledge in a workplace. AL: Can you share an interesting anecdote or two from your career? EM: I worked in IT (network and security administration, software development) for about 8 years before changing career to actuarial profession. An opportunity arose at my workplace to train a few actuaries as part of a program to have resident qualified actuaries, and I seized the opportunity. I do however cherish IT skills I have acquired over the years and find them just as important in my current work. AL: Do you have any advice for young people in your country interested in pursuing this career? EM: Our insurance penetration is low, and actuaries are needed to ensure that there is increased insurance access, but with the reliable foundations which actuaries can bring. It is not an easy path, but once on it, it is important to celebrate one success at a time to make the journey more exciting. AL: What are some of the highlights of the history of the actuarial profession in your country? EM: We registered our actuarial society in 2018, calling it The Actuarial Society –initially, our application included the name Actuarial Society of Malawi. However, our application to use the word Malawi was denied, hence we dropped it. We do hope in the near future to successfully register the society as Actuarial Society of Malawi. The Society has 9 members, all of them students who are working. About half of these work with the insurance and pension regulator. Also, previously we did not have an examination center in Malawi until the end of 2017 (all of us are sitting the Institute and Faculty of Actuaries Exams). Previously, the closest centers were in neighboring countries. EM: The first one is to bring awareness to the public--very few people outside the insurance and pension industries know who an actuary is and why they are important. We also want to encourage young people to join the profession. Finally, we want to build confidence among members of the association, so that guidance from the association on specific regulations can be provided to the public. EM: The regulations are increasingly requiring need for actuarial involvement, so this should be a positive development. For example, draft regulations relating to short-term insurers introduce a requirement for actuaries to certify reserves. Short-term insurers currently operate without engaging actuaries at any level. There are also current plans by the regulator to introduce risk-based capital and solvency requirements to align with modern international practices--this is an opportunity for the actuarial profession. The country has drafted regulations to introduce inclusive insurance (sometimes known as microinsurance), this will lead to a significant amount of insurance data and will require the special analytical skills that actuaries possess. EM: As mentioned earlier, there are no actuaries in Malawi. However, half of the students work at the supervisory authority and the other half in one of the major, multinational insurance firms. Life insurance companies have to engage actuaries annually as per regulations. Pension Funds also involve actuaries in setting investment strategies and in recommending bonuses. EM: Being a Chartered Enterprise Risk Actuary – this will increase opportunities beyond traditional actuarial roles. However, all other actuarial qualifications are important in a country where we don’t have a single full actuary. EM: One of our public universities took in its first cohort of actuarial students in 2017. However, those sitting for professional exams study on their own, including myself. EM: We are dependent on the procedures used by established associations such as in UK, South Africa, Australia, US, etc. We recognize the credentials offered by these associations. EM: Yes, they provide study days and pay for exam fees and study materials. AL: What is your favorite Excel function and why? EM: The simple but amazing SUM function – it’s like you go through the wilderness punching numbers, and SUM brings you back out into the open. Beautiful. AL: Do you have any non-actuarial hobbies? EM: I enjoy sports, mainly walking and basketball (though I’m not one of those very good players), driving in the country and volunteering and community service. AL: Could you tell us a little bit more about your country or association’s plan for increasing the number of actuaries in Malawi? EM: At the moment we are planning to hold an open house for people to ask about actuaries and we plan to visit a university that has actuarial students to help students appreciate what the industry has for them. The challenge is that all of our members are currently students, and exams and work take up most of our time, thus making it difficult to implement these plans. AL: What could people from outside of your country do to help the profession grow in Malawi? EM: They could provide mentorship on how best to plan and implement ideas for the association. They could join the Society in its awareness sessions for potential future actuaries, e.g. actuarial students at our public university. They could provide mentorship to association members on how to study and take professional exams. And, of course, all of the aforementioned activities need financial resources – any help is welcome. AL: Is there anything else you would like to add? EM: Thank you for recognizing Malawi. In " career, eLearning, ACTEX News, Actuarial Career, communication, Leadership, professional development, Webinar "